Rohit Verma1, Shaily Mina1, Satnam Goyal2 and Kiran Jakhar2. 1 Department of Psychiatry, Lady Hardinge Medical College & Smt. S. K. Hospital, New Delhi, India. 2 Department of Psychiatry, Post Graduate Institute of Medical Education and Research, Dr RML Hospital, New Delhi, India. Chronic venous insufficiency has been associated with the development of venous stasis followed by dermatitis and later ulcer formation. It is usually observed in heart failure, obesity, varicose veins, diabetes, blood clots in the deep veins or post phlebitic syndrome. Here we are reporting a previously unreported case of Obsessive Compulsive Disorder (OCD) associated with venous dermatitis. Many patients with OCD present initially to their physician. Because of the frequency of nonspecific dermatitis in compulsive hand washers, as well as the number of patients presenting with obsessions, dermatologists should be familiar with this disorder which would lead to the early recognition and diagnosis of OCD in turn increasing effective pharmacologic and behavioural treatment strategies. With a lifetime prevalence rate of 0.5-3%, Obsessive Compulsive Disorder (OCD) is commonly seen worldwide . Obsessions are anxiety causing thoughts, impulses, or images that are intrusive repetitive and uncontrollable. Compulsions are repetitive behaviours (e.g., checking) or mental acts (e.g., counting, reassuring) by which the person attempts to control the anxiety. Behaviours causing distress for more than 1 hour per day and significant disruption of normal functioning constitute OCD . Time-consumption in obsessions and compulsions cause marked distress or functional impairment. People with OCD have been hypothesized to be more affected by possibility-based information leading to higher levels of doubt . Besides the commonly associated obsessions and compulsions mentioned above, OCD is also found to be associated with various dermatological problems secondary to underline pathology which often goes undiagnosed since very little is being known about their associations. The classic signs of venous disease are pitting edema, varicosities, spider veins (telangiectasias), reticular veins (dilated bluish sub dermal veins less than 3 mm in diameter) . Venous, or stasis, dermatitis is defined as erythema and scaling, most commonly on lower limbs of those with chronic venous insufficiency . It is seen in heart failure, obesity, varicose veins, diabetes, clots in the deep veins, or post phlebitic syndrome . The common mechanism causing venous stasis is venous hypertension due to the valvular defect. As the deep veins valve becomes incompetent, when the patients stand for a long time increased pressure is generated leading to reflux of blood from deep to superficial venous system leading to stasis . This leads to an increase in the pressure inside the leg veins, which damages the overlying skin likely due to leakage of blood and blood products into the surrounding tissue causing inflammation in the skin . We here report a case of a patient who had obsessions of contamination and compulsions of washing hands for hours in a day. This involved standing for long hours which we propose secondarily led to venous insufficiency leading to venous dermatitis in both lower limbs. A 22 year-old, Hindu unmarried male presented to psychiatry outpatient clinic with a history of insidious onset continuous course illness of 12 years duration reporting of repetitive uncontrollable thoughts of contamination of hands and doubt of something from his body falling as he walked. He would recognize these thoughts to be of his own, but report of their senselessness on few occasions only. He had to perform compulsive acts otherwise he would feel distress. The compulsive acts included washing hands for hours after going to toilet and every time after taking food. He would remain standing during this period. The patient would keep looking backside while walking in order to relieve the anxiety due to obsessions of doubt. He would also pause for significant time in standing position checking if he had lost anything from the pocket. There was no other significant past, personal, or family history. Family members tried to contact doctors but the patient would not go for treatment, saying he was not ill and did not require any medical help. The patient had stopped going for his job because of time taken in washing hands which would be >8 hours a day and the patient reports of standing for this period in bathroom every day since the last 6-7 years. Mental status examination revealed anxious affect and obsession of contamination and pathologic doubts. His Yale-Brown Obsessive Compulsive Scale score was 36 . 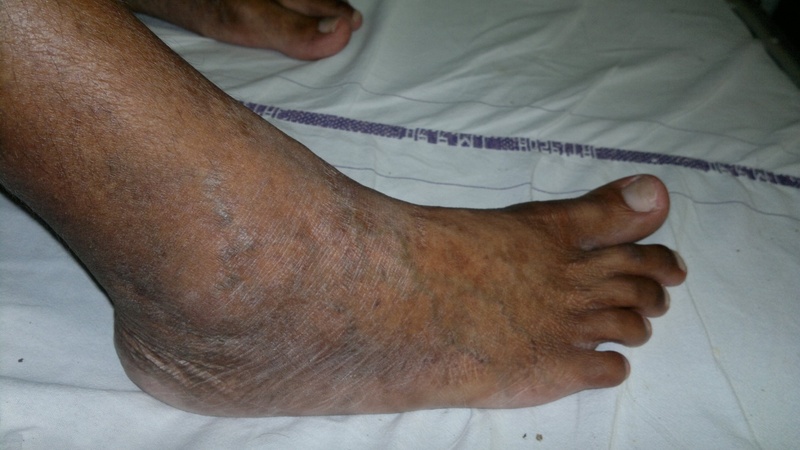 On physical examination varicose veins, pitting edema, telangectasias and reticular veins were noted in both the lower limbs predominantly around the ankles involving the feet (Figure 1). There were fan-shaped pattern of numerous small intradermal veins below the maleoli. The area had scaly patches with pigmentation. The patient reported that these changes have been present for few years and had been gradually increasing from bottom to top. He also complained of bilateral aching leg pain since 2 years. A diagnosis of OCD with poor insight was made in accordance with Diagnostic and Statistical Manual of Mental Disorders, Fourth Edition-Text Revised . Dermatology and Cardiology reference was sought and the patient was diagnosed with venous dermatitis. Colour Doppler of lower limbs showed incompetent perforators in the lower aspect of left great saphenous vein and right short saphenous vein with competent bilateral sapheno-femoral and sapheno-popliteal junctions. The insufficiency of venous valves was proposed to have caused the dermatitis. The patient was initiated on Tablet Fluoxetine 20mg/d and Exposure and Response prevention therapy with which he reported improvement in OCD symptoms over two months. Compressed stockings were advised for managing venous insufficiency with slight improvement noted over two months. Psychodermatology describes an interaction between dermatology and psychiatry. The incidence of psychiatric disorders among dermatological patients is estimated at about 30 to 60% . Prevalence of OCD ranges between 2-3% in general population which might increase to almost 14 to 25% in patients with skin problems . Common skin disorders associated with OCD are some forms of dermatitis or eczema, especially of the hand, as well as nail and cuticle picking or biting, neurotic excoriations. These lesions usually occur due to scratching, pulling, biting, picking, excessive hand washing and other self injurious behaviours. Skin diseases and psychiatric illness may be interrelated in various ways . While dermatological disorders may be generated or aggravated by psychological disorders (like in trichotillomania, urticaria or icthyosis), dermatological disorders may result in few psychiatric disorders (like in psoriasis or atopic dermatitis). In the case described above, insufficiency of valves followed prolonged standing for hours a day, since the last 6-7 years. Other causes were ruled out. The patient reported of poor insight into his symptoms during the major part of the illness which is a common cause for late presentation of patients with OCD. A previous case report listed evidence of varicose veins in OCD . People with OCD may initially present to general physicians or dermatologists for physical problems secondary to OCD. A study showed that 20% of patients seeking treatment in a dermatology clinic had an OCD and secondary skin problem . Few studies have found almost 5 times more frequency of OCD in dermatological problems in comparison to the general population . In a study, more than 45% patients with psychogenic excoriation presented to dermatology were diagnosed with OCD . A study concluded most common obsessions were contamination in patients presenting to dermatology clinics . As reported that people with OCD frequently present to dermatology clinics before going to a psychiatrist, our patient had also sought treatment for discolouration of skin along with itching a few years back and was diagnosed with eczema with no screening for OCD and the patient was never suggested to visit a psychiatric facility which led to a persistence of physical symptoms. The time of presentation of patients with OCD is long during which they may suffer from secondary co-morbid illnesses. The people presenting with venous dermatitis should be screened for cause of stasis so as to find any causal obsessive compulsive pathology. 1. Degonda M, Wyss M, Angst J. The Zurich Study. XVIII. Obsessive-compulsive disorders and syndromes in the general population. Eur Arch Psychiatry Clin Neurosci. 243:16-22, 1993. 2. American Psychiatric Association. Diagnostic and Statistical Manual of Mental Disorders. 4th ed. Washington, DC: American Psychiatric Association, 1994. 3. Aardema F, O'Connor KP, Pélissier MC, Lavoie ME. The quantification of doubt in obsessive-compulsive disorder. Int J Cogn Ther. 2(2):188-205, 2009. 4. Ross DS. Venous stasis ulcers: a review. Northeast Florida Medicine 63(2):29-33, 2012. 5. Hess CT. Clinical Guide to Skin and Wound Care. 6th ed. Philadelphia: Lippincott Williams & Wilkins; 2008. 6. Hjelmstedt A. Pressure decrease in the dorsal pedal veins on walking in persons with and without thrombosis. A study of a fracture series. Acta Chir Scand. 134:531-539, 1968. 7. Goodman WK, Price LH, Rasmussen SA, Mazure C, Fleischmann RL, Hill CL, Heninger GR, Charney DS. The Yale-Brown Obsessive Compulsive Scale: I. Development, use and reliability. Arch Gen Psychiatry. 46:1006-1011, 1989. 8. Korabel H, Dudek D, Jaworek A, Wojas-Pelc A. Psychodermatology: Psychological and psychiatrical aspects of aspects of dermatology. Przegl Lek. 65:244-248, 2008. 9. Jesitus J. Dermatologists must beware of skin-related signs of OCD. Dermatology Times 2011, December 1. 10. Kieć-Swierczyńska M, Dudek B, Krecisz B, Swierczyńska-Machura D, Dudek W, Garnczarek A, Turczyn K. The role of psychological factors and psychiatric disorders in skin diseases. Med Pr. 57:551-555, 2006. 11. 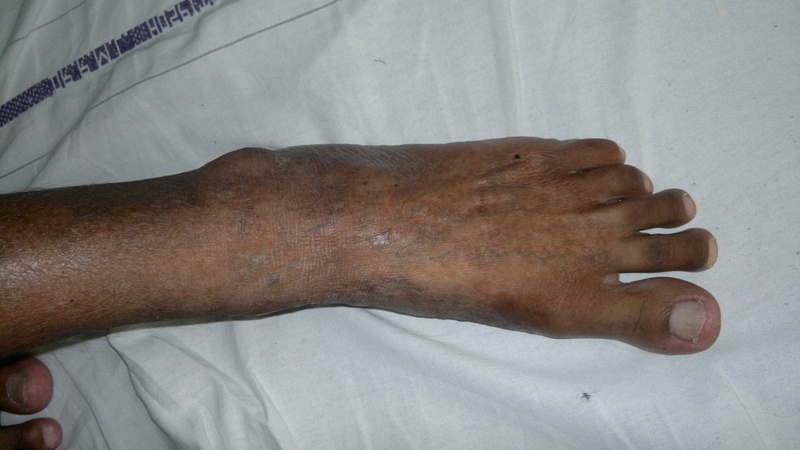 Aggarwal A, Jain M, Khandelwal A. Varicose Veins in Obsessive-Compulsive Disorder Due to Pathologic Doubts. Prim psychiatry. 17(7):35-36, 2010. 12. Lamberg L. OCD Patients May Seek Help From Dermatologists. Psychiatr News. 42:18-27, 2007. 13. Ebrahimi AA, Salehi M, Tafti AK. Obsessive-compulsive disorder in dermatology outpatients. Int J Psychiatry Clin Pract. 11(3):218-221, 2007. 14. Calikuşu C, Yücel B, Polat A, Baykal C. The relationship between psychogenic excoriation and psychiatric disorders: a comparative study. Turk Psikiyatri Derg. 13(4):282-289, 2002. 15. Demet MM, Deveci A, Taskin EO, Ermertcan AT, Yurtsever F, Deniz F, Bayraktar D, Ozturkcan S. Obsessive-compulsive disorder in a dermatology outpatient clinic. Gen Hosp Psychiatry. 27(6):426-430. 2005.